A true legend, Harley Race has enjoyed almost unparalleled success in the world of professional wrestling. Having turned pro in 1959 at the age of 15, his work ethic and innovative style allowed him to become one of the three biggest names in wrestling during the 1970s and early ’80s. He won the National Wrestling Alliance (NWA) championship on eight occasions and was dubbed World Wrestling Entertainment’s first “King of the Ring” in 1986. In the autobiography King of the Ring, Harley Race tells his incredible life story for the first time. In addition to his legendary ring career, Harley Race also became a successful promoter in the Midwest during the mid ’80s with a wrestling organization seen on 13 television stations covering five states. Although injuries and a car accident in 1995 effectively ended his wrestling career, he decided to give back to the sport he loved. Race opened the World League Wrestling (WLW) organization in 1999, which serves both as a training camp and as a touring organization for young wrestlers. King of the Ring explores Race’s life and career, both in and out of the ring, detailing everything from the grind of traveling 300 days a year to the glory of being a world champion. 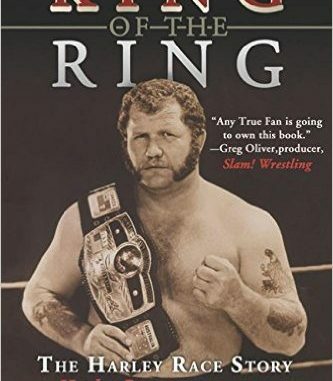 From the pitfalls and vices associated with professional wrestling to overcoming career threatening injuries and the death of his first wife, the Harley Race readers will meet in King of the Ring is as candid as he is successful. Harley Race runs the WLW, a family-based wrestling promotion and training academy. WLW’s slogan is “Shut Up and Wrestle.” He lives in Eldon, Missouri, with his wife, BJ. Gerry Tritz is a lifelong Harley Race fan and an editor for the Jefferson City News Tribune in Missouri. This is his first book. He resides in Jefferson City.